National Oceanic and Atmospheric Administration (NOAA) scientists are setting off on a 6-day research mission exploring the remote habitats of Cordell Bank National Marine Sanctuary and testing methods of removing derelict fishing gear from the seafloor using a Remotely Operated Vehicle (ROV). Historically, Cordell Bank has been heavily visited by recreational and commercial fishing boats, and like flying a kite near trees, fishing gear has snagged on the Bank and remains tangled on the bottom. 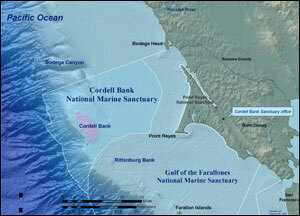 Cordell Bank, which is the main feature of Cordell Bank National Marine Sanctuary, is located on the continental shelf, about 50 miles northwest of the Golden Gate Bridge and 20 miles west of the Point Reyes lighthouse. This mountainous submerged rock is 4.5 miles wide by 9.5 miles long and emerges from the soft sediments of the continental shelf, with the upper pinnacles reaching to within 115 feet of the ocean's surface. These shallow pinnacles are encrusted with colorful, diverse invertebrates piling on top of each other competing for precious space to live and eat. Colorful hydrocorals sit amongst strawberry anemones, huge sponges, tunicates, sea stars, urchins, sea cucumbers, and crabs, all animals that make Cordell Bank their home. That’s not to mention all the fishes that live amongst this colorful and productive bank, including bottom fish such as rockfish and lingcod. Over the years, Sanctuary scientists have documented significant amounts of derelict fishing gear on the Bank when conducting research on the seafloor communities and habitats in Cordell Bank National Marine Sanctuary. 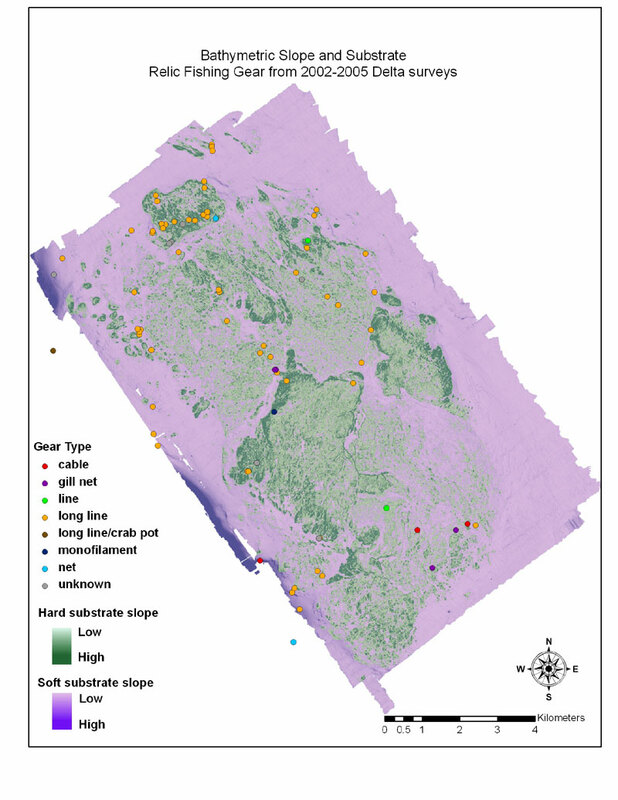 In 2002, derelict fishing gear was observed on 90% of the research transects conducted across the rocky habitats on Cordell Bank. 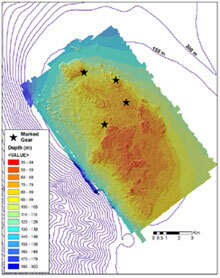 Gear was less likely to be found in mud or sand bottom habitats compared with rocky reef environments. This gear includes long lines, gill nets, crab and trawling gear, which are entangled on the Bank and some extending into the water column. derelict fishing gear poses a potential hazard to underwater vehicles, manned and remotely-operated, the safe deployment of which is critical for our monitoring and management of this unique underwater habitat. 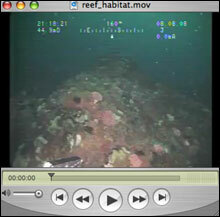 In 2006, remote operated vehicle (ROV) dives were completed on and around Cordell Bank to locate, mark, and describe derelict fishing gear. This undersea vehicle was also used to characterize the types of habitats that gear is found in and assess the degree of difficulty in removing different types of gear. In some locations, lines rest gently on top of boulders and sand flats for hundreds of yards, while in other locations, lines and nets have formed a monster of snarled line that is entangled in every crevice of the rocky environment. Animals seem to have preferences on the type of gear to live on: some types of lines are densely covered with invertebrates, which compete with each other for space, while other types of line are obviously unattractive for marine creatures to live on. 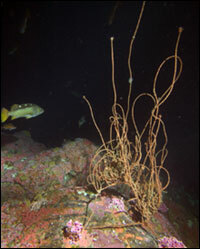 Increase our knowledge of the degree to which derelict fishing gear is impacting the unique habitats and marine life of Cordell Bank National Marine Sanctuary. 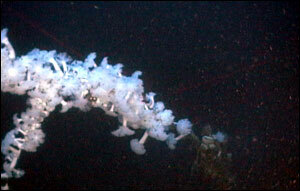 Develop policies and procedures for derelict fishing gear removal in deep water (>100 ft). Provide images and video to be used for education and outreach purposes. 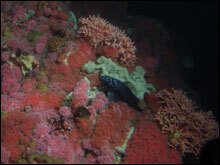 The planned cruise will involve testing various techniques of removing derelict gear from the seafloor using an ROV fitted with a manipulator arm and cutting device. Since Cordell Bank is located at depths of 115-300 ft, and is often dominated by strong currents, using ROVs is one of the best ways to investigate the underwater environment and to conduct operations on the seafloor. Results from these cruises will provide valuable information including documentation of the amount and type of gear present within the Sanctuary, as well as the habitats in which the gear is located. 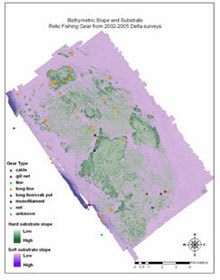 This information will help managers to protect the animals and unique habitats within the Sanctuary. The experience gained while testing the feasibility of removing derelict fishing gear from deep-water habitats in Cordell Bank NMS is hoped to be applied to other deep-water reef environments throughout the country. Support for this cruise was provided by NOAA’s National Marine Sanctuary Program and NOAA’s Marine Debris Program as well as the National Marine Sanctuary Foundation . Partners involved in the work include the SeaDoc Society - University of California-Davis Wildlife Health Center and Marine Applied Research and Exploration (MARe) . 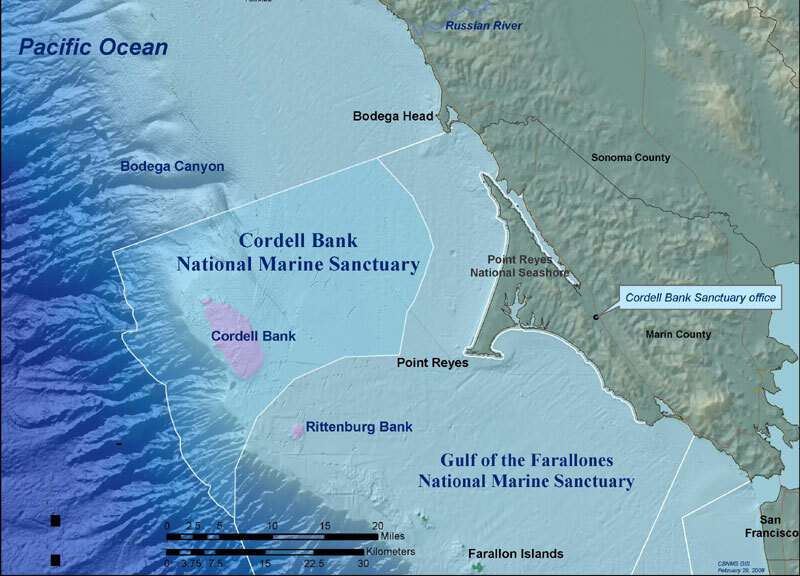 Please visit the Sanctuary Integrated Monitoring Program website for more information about Cordell Bank National Marine Sanctuary.